Thallus: crustose to subfruticose, thick, pulvinate-verruculose or glebulose-areolate; prothallus: seldom visible, radiate, the outer most edges gray to blackish blue, the inner edges soon covered by white or yellowish white radiate hyphal layers areoles: at first adnate and semi-globular (0.2-0.3 mm in diam. ), later becoming globose to irregular, 0.8-1.5(-2.3) mm high, 1(-1.5) mm in diam., dispersed or tightly aggregated, sometimes becoming narrow, +cylindrical (c. 0.5 mm in diam.) and finally +coralloid branched, 1-5(-6) mm high surface: yellowish white, pale to grayish or greenish yellow, towards thallus margin sometimes weakly lobed (rosulate), esorediate Apothecia: very frequent, dispersed or aggregated, broadly then narrowly sessile, (0.5-)1.2(-3) mm in diam. disc: mostly dark red-brown to black, mostly shiny, plane then +convex, epruinose margin: persistent, usually thin, +repand, subcrenulate, mostly 120-140 µm wide, concolorous with thallus, somewhat prominent when young, without a parathecial ring amphithecium: present, with an algal layer, filled with small crystals that do not dissolve in K, corticate; cortex: gelatinous, distinct, 10-30 µm laterally, 30-70 µm basally parathecium: indistinct, lacking crystals, 15-30 µm thick epihymenium: light to dark brown, with crystals dissolving in K hymenium: hyaline, mostly 70-75 µm tall; paraphyses: 2 µm thick, short and slightly expanded apically asci: clavate, 8-spored ascospores: hyaline, simple, broadly ellipsoid to ellipsoid, 9.5-16.2 x 5.7-9.5 µm Pycnidia: rather rare, immersed; ostioles: black conidia: filiform, straight or slightly curved, 21-39 µm long Spot tests: cortex K+ yellow, C-, KC+ yellow, P- or P+ pale yellow; medulla usually K- (or pale yellow), C-, KC-, P- Secondary metabolites: atranorin, usually with epanorin, zeorin, and fatty acids, less often with other combinations of substances in addition to atranorin. Substrate and ecology: on siliceous or calcareous rocks, sometimes spreading to detritus, moss, or other lichens World distribution: circumpolar with center of distribution in +continental areas, known from Europe, northern Africa, western and central Asia, Greenland, and North America Sonoran distribution: Arizona, southern California, Baja California, Baja California Sur and Sonora. Notes: The thallus color of L. argopholis varies from pale gray to pale yellow. Yellowish forms are easily recognized, but grayish morphs may resemble members of the L. subfusca-group. They differ, however, in amphithecial anatomy. 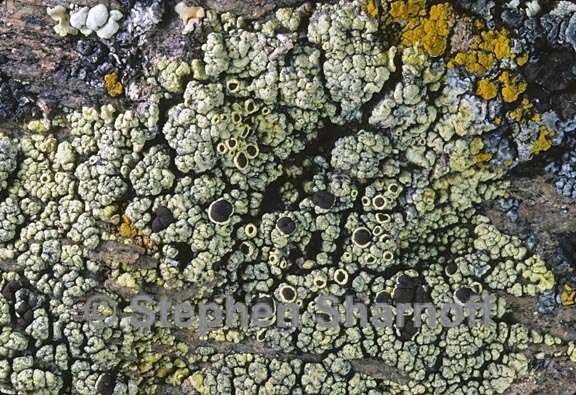 The thallus not infrequently develops small marginal lobes, causing it to resemble rosulate species of Lecanora subg. Placodium, from which it is easily separated by containing atranorin (K+ yellow) and lacking usnic acids (KC-).